Peptide (C)RQPSSPGPQPRNLSE, corresponding to amino acid residues 191-205 of mouse α1-syntrophin (Accession Q61234). Intracellular, PH1 domain. Homology Mouse, human – identical. 1,2. Anti-α1-Syntrophin (SNTA1) Antibody (#APZ-021), (1:400). 3,4. Anti-α1-Syntrophin (SNTA1) Antibody, preincubated with the control peptide antigen. 1. Anti-α1-Syntrophin (SNTA1) Antibody (#APZ-021), (1:200). 2. Anti-α1-Syntrophin (SNTA1) Antibody, preincubated with the control peptide antigen. 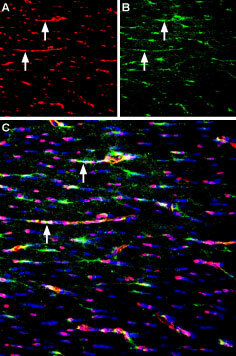 Immunohistochemical staining of perfusion-fixed frozen mouse brain sections using Anti-α1-Syntrophin (SNTA1) Antibody (#APZ-021), (1:400), followed by anti-rabbit-AlexaFluor-488 antibody (green). 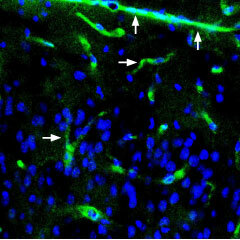 Syntrophin alpha 1 staining (green) appears in blood vessels (horizontal arrows) and in the pia mater (vertical arrows). Nuclei are stained with DAPI (blue). Bhat, H.F. et al. (2014) Br. J. Cancer. 110, 706. Wilde, A.A. et al. (2011) Circ. Res. 108, 884. Willis, B.C. et al. (2105) Am. J. Physiol. Heart. Circ. Physiol. 308, 1463. Anderova, M. et al. (2014) PLoS One 9, e113444. Williams, J.C. et al. (006) J. Biol. Chem. 281, 23341. Koo, T. et al. (2011) Hum. Gene. Ther. 22, 1379.
α1-Syntrophin is a component of the dystrophin scaffold-protein complex that acts in recruiting proteins through their multiple protein–protein interaction motifs to the cytoplasmic side of plasma membranes. Proteins interacting with α1-syntrophin include voltage-gated sodium channels, neuronal nitric oxide synthase, calmodulin, ankyrin repeat-rich membrane spanning protein, G-proteins and more. The syntrophin family comprises five members: α1-syntrophin, β1-syntrophin, β2-syntrophin, γ1-syntrophin, and γ2-syntrophin1. α1- Syntrophin is a peripheral cytoplasmic membrane protein in skeletal and cardiac muscle cells1. The α1-syntrophin structure contains four conserved domains, two pleckstrin homology domains (PH1 and PH2), a PSD95-disks large-ZO1 (PDZ) domain and a syntrophin unique (SU) COOH-terminal domain2. The pleckstrin domains are responsible for the recruitment of proteins to the sarcolemma. The PDZ domain is inserted within the PH1 domain and binds to NOS-1 in skeletal muscle. This domain also binds to the C-terminus of the Kir2.1 channel and also to NaV1.5 and so allowing them to interact. The SU domain binds syntrophin to dystrophin2,3. α1-Syntrophin is also responsible for the site-specific anchoring of AQP4 protein. α1-Syntrophin deletion leads to the disruption of the polarized subcellular expression of AQP4 in the perivascular membranes4. Several studies have shown that syntrophin-deficiency in Duchenne muscular dystrophy can ultimately lead to muscle degeneration. Syntrophin-deficiency was also shown to reduce levels of nNOS in mice5,6. Immunohistochemical staining of immersion-fixed, free floating rat brain frozen sections using Guinea pig Anti-Kir4.1 (KCNJ10) Antibody (#AGP-012), (1:400) and rabbit Anti-α1-Syntrophin (SNTA1) Antibody (#APZ-021), (1:300). A. Kir4.1 staining (red) appears in blood vessel profiles (arrows) in the fornix. B. Syntrophin alpha 1 staining in the same section (green) appears in several elements including blood vessels (arrows). C. Merge of the two images reveals partial co-localization of Kir4.1 and syntrophin alpha 1 in hilar cells. Cell nuclei are stained with DAPI (blue). Alomone Labs is pleased to offer a highly specific antibody directed against an epitope of mouse syntrophin alpha 1. Anti-α1-Syntrophin (SNTA1) Antibody (#APZ-021) can be used in western blot and immunohistochemistry applications. It has been designed to recognize syntrophin alpha 1 from mouse, rat and human samples.